Back in May I offered three slots to draw people’s Monsters, so I could by Havi’s Monster Coloring Book. It’s taken a while to get both of us connected (she’s a busy one! 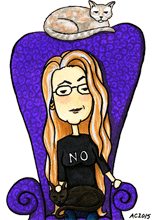 ), but I finally have the third one done, for Naomi Dunford of Ittybiz. 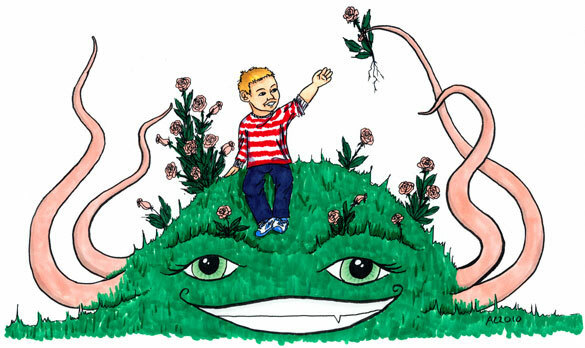 Naomi didn’t have a specific Monster she wanted colored, so she sent me some pictures of Jack and we talked a little, and I did a sketch for her of this friendly little hill monster offering Jack a pink rose (Naomi has a thing for pink roses. Who knew?). It took a while to get it from idea to finished product, but I love the cheerful green and pink result, a non-creepy monster for her to hang on the wall.